The PeT is all in Japanese. This is a large collection, but is not a Complete set. (Manufacture :TAKARA. DX PROGRESS PET SET RED NO BOX. 1) PROGRESS PET CONSOLE : 1EA. 3) BATTLE CHIP : 5 EA. 4) SPEED GRIP : 1EA. Condition :New (No Box). Sorry, but we will not break up the set. - Corocoro (Promotional Exclusive). It includes one Battle Chip. This item is not graded. 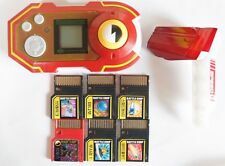 Mega Man PET Red Personal Terminal Takara Capcom 2004 Mattel - NO BATTLE CHIPS. Condition is Used. Shipped with USPS Priority Mail. Has some minor scuffs do to age. This item is not graded. (Manufacture :TAKARA. DX PROGRESS PET SET BLUE NO BOX. 1) PROGRESS PET CONSOLE : 1EA. 3) BATTLE CHIP : 5 EA. 4) HP GRIP : 1EA. Condition :New (No Box). You will receive - #793 Cannon Mode. - #794 Hougan Mode. - #795 Sword Mode. - #796 Yo-Yo Mode. - #797 Drill Mode. (Manufacture :TAKARA. DX PROGRESS PET BLUE & BATTLE CHIP COLLECTION. 1) PROGRESS PET SET: 1EA. Released: In 2005. (DX PROGRESS PET BLUE & BATTLE CHIP(30EA). Manufacture :TAKARA. 2) BATTLE CHIP : 30 EA (Random). 1) PROGRESS PET SET: 1EA. Released: In 2005. But new pet version of photothermal DOO hero actually has in the play. Customize use the parts that. Of course, it can also be used battle chip until now. [ Release Date(yyyy/mm/dd) ]. We do our best for you!! #242 Numberman. - #243 Numberman SP. - #244 Numberman DS. You will receive. We only carry Genuine Authentic Products. This product is a collection of hobby goods, but it is not necessarily the information that can not be inevitably provided in the case of products made with product information in the 70s ~ 90s. #245 Tomahawkman. - #246 Tomahawkman EX. - #247 Tomahawkman SP. You will receive. (Manufacture :TAKARA. DX PROGRESS PET RED & BATTLE CHIP COLLECTION SET. 1) PROGRESS PET SET: 1EA. Released: In 2005. Manufactured by Takara / Korea Importer : Sonokong 2006. 1ea x Progress Pet Body. 1ea x Hit Point Grip (Speed Grip). It is the fastest way to settle your concern or issue. 1ea x Cable.